Based on open source design of the Original Prusa i3 Mk3S by Josef Prusa, these 3d printers are now proudly Manufactured in India by 3DPrintronics. Prusa i3 Mk3S 3D Printer - fully built, calibrated and tested. Includes One kg Premium PLA filament from Fillamentum. Ultimachine Einsy Board - silent printing, high reliability, precise print quality. E3D HotEnd - 40% faster printing. New Filament Sensor - IR sensor. Mk52 Magnetic Heated Bed with , ORIGINAL Spring Steel Sheet (PEI pasted) from Prusa 3d - No worrying about sticking of your prints, Easy print removal. Heated Bed cold corner compensation - warp less printing with any material. PINDA 2 Sensor - Full auto bed levelling, Skew Axis Compensation. Original Bondtech Drive Gears - no more missed steps. Original Sunon Hotend Cooling fan. Supported materials - PLA, ABS, PET, HIPS, Flex PP, Ninjaflex, Laywood, Laybrick, Nylon, Bamboofill, Bronzefill, ASA, T-Glase, Carbon-fibers enhanced filaments, Polycarbonates. Our machine is based on the Bear Upgrade frame - it uses the sturdier and more stable aluminum extrusion based frame (Bear upgrade) which enables shipping with less chances of damage. Power panic is not included. We are 3d printer manufacturers in India and have been working on Prusa i3 open source 3d printers since last 4 years. We have provided hundreds of Prusa i3 3d printer DIY Kits in India supported with our famous tutorials. Our Prusa i3 Mk3 clones are hugely successful and empowering a large number of makers in India. 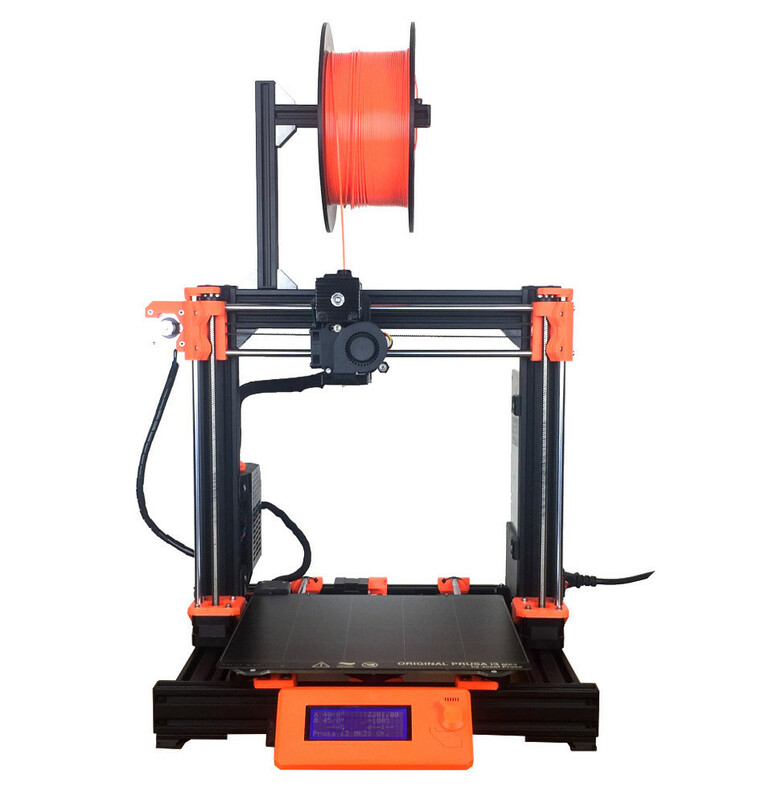 This printer is based on the design of Original Prusa i3 Mk3s by Prusa3d.com. We use exactly the same components as used by Prusa3d in making the printers.We constantly upgrade the printer as per the feedback which is available in the open source community. 3d printing is our 24x7 job, so be assured that you will get full support from us. Avoid hassles related to customs, documentation etc while importing. You will get your printer, ready to print out of box all inclusive of the costs. Importing a printer from outside India involves about 30-40% custom duty on the Price + Shipping. Free shipping applicable for within India only. International customers pls contact us for shipping quotes. We use Fedex Ground Shipping for shipping printers within India. Tentative Delivery time is 5 to 6 working days from the date of dispatch (Depends on destination). We manufacture these printers in India and we are not affiliated to Prusa3d.